Today is a big day. We have been dreading this day since our termination doctor kindly warned us to have a plan around today, because it would knock us flat. Today is Grace Pearl's due date. 3/31/17. I've had that date in my head for so long. Because we did IVF, we knew the due date before I even got pregnant with Grace. Crazy isn't it? When you do a frozen embryo transfer, you have to prepare your body for weeks/months in advance depending on the protocol you have. So for weeks, I knew that unless something went awry, we'd transfer a little 5 day embryo on July 13th, and that embryo, if it made it to birth, would be due today, March 31st, 2017. I don't know if I can fully express how much I wish it'd turned out that way. I know life has taken me a different and still meaningful direction since then, and at some point I'll write more about how I feel like advocacy chose me, not the other way around, and that in nearly every area of my life I feel like I'm on a rollercoaster with no option for getting off, from the grief to the advocacy work. I am glad some good is hopefully coming from this, and I hope that I'm doing Grace proud. But for now, I just want to honor Grace Pearl, and how much I wish I'd gotten to have more time with her. How much I wish I'd gotten to watch her grown up. When we got pregnant with her, we were utterly delighted. We'd been trying for over 3 years and it felt like it was finally our time! I took seemingly endless pregnancy tests to confirm and reconfirm over and over that I was indeed pregnant. By our 6 week appointment we got to see and hear Grace's heartbeat, which brought tears to my eyes, and by week 8 she growing rapidly. 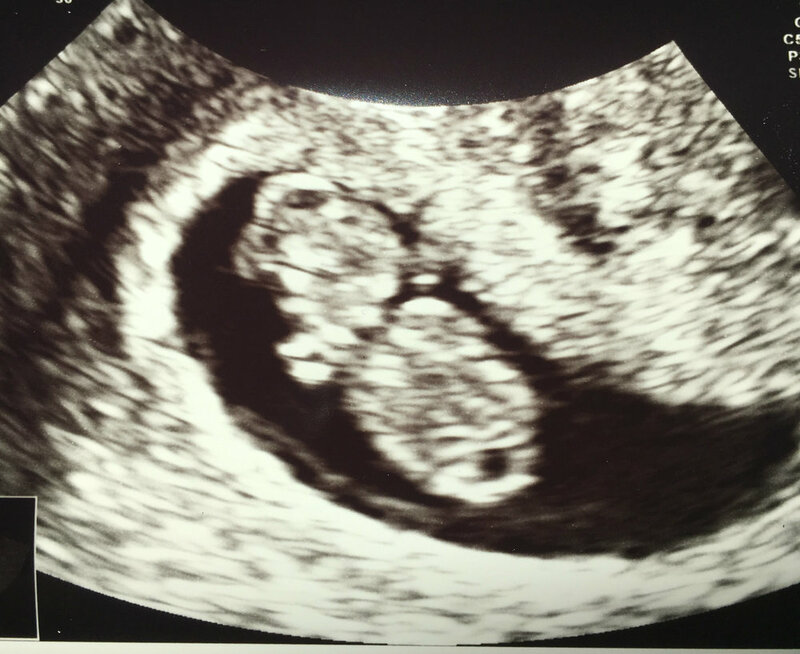 By week 10 she looked like a little gummy bear and kicked away at the ultrasound wand. We announced to all of our friends and family, and on Facebook. We started designing Grace's nursery, and dear friends had started planning a shower for me. We registered with my mom the weekend before we learned about Grace's fatal illness. It remains very, very hard for me to think back to mid-November when we learned about Grace's diagnosis, and 6 days later when she was terminated. As I gathered pictures from my phone camera roll for this post, they fall away then. I don't have her final ultrasound pictures because my parents came and collected them as well as all of the things we'd gotten for Grace while we were signing the consents to have the termination done. All of it remains hidden at their house, in what they call the Hope Pile. You start moving on with your life, and both hope and immense grief remain. It's been 4 months, and the pain is still acute. I'm glad to be smiling and laughing more easily, but honestly I'm still very, very sad. I don't know how else to put it. Having dance parties with her in our living room. Traveling with her to some of our favorite places, especially our favorite cities and National Parks. Teaching her how to ride her bike and taking rides through the city together. Seeing what she looked like! Would she have my blue eyes and red hair, or Jim's black hair and hazel eyes? Based on the hand and foot prints we got, I know she had his feet and hands. I'm grateful for this one little detail we were able to learn. Today, Jim and I are going to start the process of spreading bits of her ashes in some of our most cherished spots, if we can bear it. The idea of splitting her ashes up feels really hard for me - I haven't done it yet. Throughout all of this pain, Jim and I have remained solidly devoted to each other, and respectful of our shared and individual loss and pain, and grateful to have been in alignment on the choice we made to save Grace Pearl from suffering. I'm so grateful this hasn't take the toll on our marriage that it does many. But the fact is we were hoping to have this day be the day we started being a family of three, and while the sadness that that isn't the reality changes, it doesn't go away.